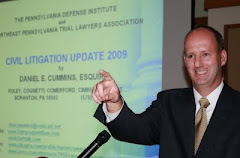 According to an article by Dave Janoski in the Citizens Voice, Luzerne County Court of Common Pleas Judge Michael Toole will be pleading guilty to fraud charges and will resign from the bench. Toole faces up to 23 years in prison. According to an announcement from the U.S. Attorney's office earlier today, Toole has agreed to plead guilty to federal charges of honest services fraud and filing a false income tax return. The criminal complaint against Toole alleges that Toole secretly communicated with an attorney to detemine who that attorney wished to have appointed as a netural arbitrator in an underinsured motorist case. The attorney, who is identified only as participant #1, had allegedly given Toole free use of a New Jersey beach house. Toole allegedly failed to disclose that information to other parties involved in the arbitration case. Toole is also charged with failing to report in his 2006 income tax return approximately $30,000 he allegedly received as a referral fee from another attorney. Toole is the third Luzerne County Judge and 20th person overall to be charged in the ongoing corruption probe by the U.S. Attorney's Office.